I’ve been praying on and off for days ~ wondering how to finish this series. I wanted to give some parting word to inspire us to pursue the love of God that is real and accessible to us now as His daughters. The day Jesus rose from the dead, He joined two men who were leaving Jerusalem on their way to Emmaus. They were vigorously discussing the events surrounding Jesus’ death and resurrection. While walking, Jesus joined them but He blinded their eyes from recognizing Him. The three of them walked and talked on that 7 mile journey and He opened up the scriptures to speak in a manner only He could. Finally, just before leaving them, Jesus opened their eyes to see who they had been talking to. And then it clicked. They knew! They said to one another, “Didn’t our hearts burn within us as He talked with us?” In retrospect, it’s always easy to see it. Right? So, I say...let’s not make the same mistake and miss what can be ours right now! Let’s not wait until then to know what is true at this very moment. Let’s not play it safe and continue to live like orphans. We are daughters and we can live like the chosen and cherished daughters we are. We don’t have to wait until heaven to know what it’s like to walk in the light of His favor. What happens on the days I’m not feeling it? 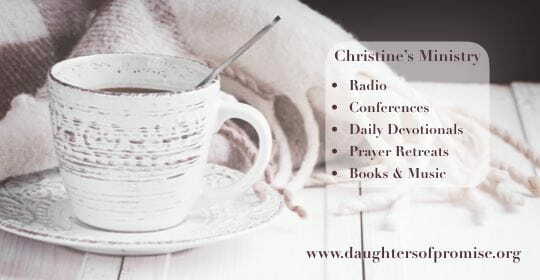 God’s Spirit reminds me that I am a daughter who walks by faith. I verbalize, out loud if need be, who God says I am. When I do that, God is pleased with my faith and is the rewarder of those who diligently seek Him. When I’m tempted to walk in my old default orphan-pathways, I stop myself short. I will not place my feet in orphan territory. I am a blood bought, forgiven, chosen and cherished child of the King. As this series comes to a close, drive a stake in the ground of your faith. Draw a spiritual line in the sand. Let this moment be a defining one. Get up and live, girl! You’re a much-loved daughter.